Now with a chemical tanker, if you have a hazardous chemical, the receiver may ask you to wait in a safe area within the complex while qualified and well-equipped workers unload the product. Another unique aspect of hauling a tanker is the fact that you must go to a tank wash and get your tanker washed out after every load, unless you are hauling the exact same product again. Larger companies will try to save time and money by having spare tanks at the tank washes that you can just swap out and keep rolling. They may also try to get you back to back loads of the same product if possible. But if you work for a small company you will usually have to get the tank washed after every load. This can take several hours at best or an entire wasted day at worst to accomplish. Since you are generally getting paid by the mile or by the load you don't want to waste time this way. Some companies will pay you a little bit for your time while you're getting a tank washed, but the small amount of money isn't worth the time. Now there are some unique advantages to hauling a tanker that I really enjoyed. For starters, you are ALWAYS heavy. Now this is a small disadvantage when dealing with mountains, but in the winter time the extra weight really significantly helps the truck hold the road. Another advantage is that you don't have to worry about individual axle weights because the liquid will balance itself. 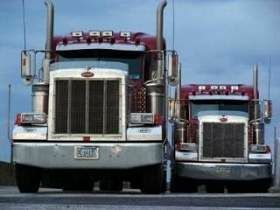 Getting the axle weights to balance evenly can be a real hassle with other forms of trucking. Not having to deal with axle weights is a nice bonus. The tanks, especially the liquid tanks, are much shorter than other types of trailers which means you don't have to worry too much about going under low bridges. It may not be the best place to start as a brand new driver, but it is certainly worth considering after you get a bit of experience under your belt. Now DON'T GET CRAZY here. It's not that you can't hit a bridge, but you are about a foot shorter than a standard trailer and the foot is a HUGE difference. I was pretty happy about that too. Finally, the round tank is much nicer in the wind than a flat-sided trailer. This really is a very big deal especially when you are empty. You might not expect a big rig to get blown around that easily in the wind but you may soon find out otherwise. Driving an empty rig feels like you're driving a sailboat down the road especially in winds about 25 mph or so. So as you can probably tell I'm quite fond of pulling a tanker, especially a food-grade tanker. There are some nice advantages to it but please be forewarned...the sloshing liquid can be extremely dangerous if you're not careful. It may not be the best place to start as a brand new driver, but it is certainly worth considering after you get a bit of experience under your belt.